Our thoughts are with everyone affected by Hurricanes Harvey and Irma. Merck provides disaster-relief assistance through cash and product donations during major disasters and supports efforts in disaster preparedness and recovery. We are committed to helping those helping in the wake of these recent storms. Today, Merck announced a donation of $1 million to the Hand in Hand Hurricane Relief Fund to support Hand in Hand: A Benefit for Hurricane Relief television fundraiser. The one-hour special will include a host of celebrities who are supporting Hurricane Harvey and Hurricane Irma disaster relief. The special will air live on Tuesday, Sept. 12 at 8 p.m. EST and re-air at 8 p.m. PST. For more information about Hand in Hand: A Benefit for Hurricane Relief, visit www.HandInHand2017.com. Natural disasters can happen at any moment. 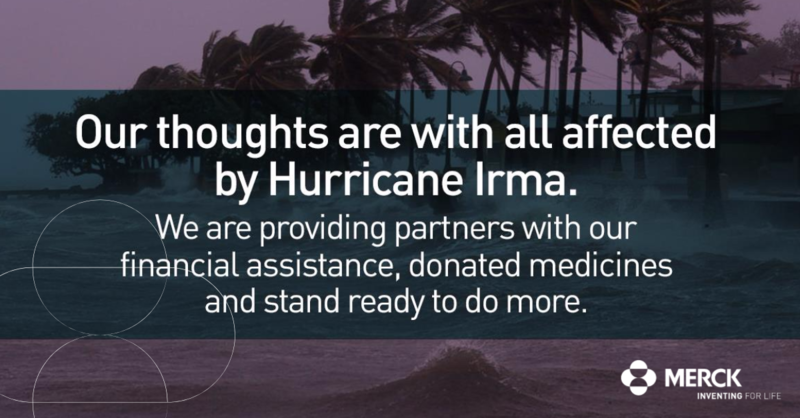 Learn more about Merck's overall disaster relief efforts and the Hurricane Harvey and Hurricane Irma relief efforts.